15% discounted Epic Recreation coupon for all water and mountain rentals! This newly furnished condo includes a queen bedroom with a bathroom, a fully equipped kitchen (more detailed in "Amenities"), and a living room which includes a queen pull-out couch. 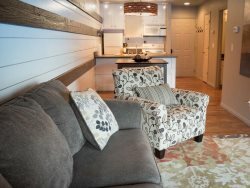 Condo #202 is the perfect size for a couple or small family that wants a fun getaway! We liked the kitchen area. We liked how close it was to Garden City and Bear Lake.